Jeff Henry, Public Defenders Conference; Page Edward, Assistant Director of the Public Defenders Conference; Senator Beavers; Governor Haslam, Representative Mike Carter (R-Ooltewah); and Representative Micah Van Huss (R-Gray). Legislation sponsored by Senator Mae Beavers (R-Mt. Juliet) prohibiting state and local police agencies from accessing or retrieving the location data of residents by surveillance of an electronic device without a court warrant was recently signed into law. 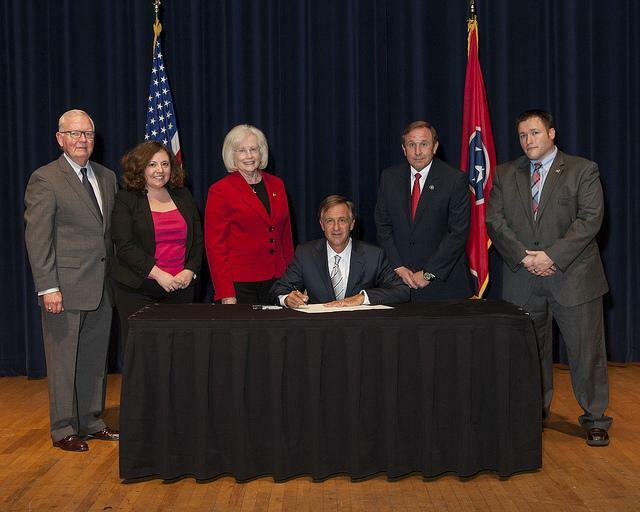 Governor Bill Haslam signed the bill at a ceremony last week in Nashville. The new law helps to ensure the government does not take advantage of technological advances in cell phones, laptops and other electronic devices to spy without appropriate judicial oversight. Law enforcement made 1.1 million requests to wireless carriers for cellphone data information in 2012 according to a report delivered to Congress in December. The three largest wireless companies, AT&T, Sprint and Verizon reported they have received 56,400 “emergency” requests from police departments which did not have a warrant or court order. One company reported their requests from police have doubled in the past five years. In addition, public records obtained by USA Today and Gannett reveal that about one in four law enforcement agencies in the U.S. have used “tower dumps.” This is a surveillance tactic which covers multiple towers and wireless providers to give police a multitude of electronic data about a targeted cell phone user. The digital dragnets also capture information on other persons using wireless devices in the area who are not suspected of wrongdoing. The electronic privacy bill, which is modeled after a Montana law, allows exceptions in order to respond to a possible life-threatening situation, an emergency call by the user, when a device is reported as stolen, or other exigent circumstances, unless there is informed consent by the owner. The legislation prescribes a Class C misdemeanor for violation.